The Wilin Centre’s Short Black Opera for Kids program was specifically designed to improve the prospects of Indigenous children living in regional areas by identifying talent, raising expectations and fostering dialogue and respect between Indigenous and non-Indigenous communities. The Wilin Centre and the Short Black Opera Company visited Portland, Victoria to conduct Music and Performance workshops with local Indigenous children from the region. The Wilin Centre’s community engagement program is not just about working with children, but also designed to make lasting connections within the region as a whole. Meetings with the Winda Mara Aboriginal Corporation in the nearby town of Heywood, and the local council’s Indigenous advisory group were also held.The program culminated with a final pubic rehearsal in which parents, friends and family members were given the opportunity to observe the process that the students had been a part of. The children who participated in Wilin and SBO’s workshops were also given the opportunity to travel to Melbourne in August 2013 to participate in the Wilin Centre’s major choral conference Dhungala Choral Connection, held at the VCA and Federation Square. The benefits of being part of this project for students and alumni of the Faculty has been significant in that it has allowed participants to build core teaching skills and experience working with classroom-sized groups of children in an educational framework. The project also gives participants the opportunity to hone their performance skills and gain vital experience through public recitals and staged operatic performances. Of much greater significance however is the benefit to regional communities. 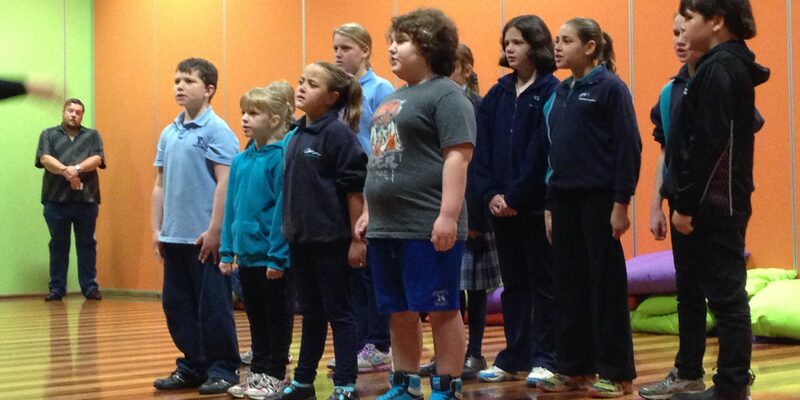 Because this project is aimed at changing the outcomes for local Indigenous youth by raising expectations and giving them the opportunity to excel, coupled with the incursions into local Secondary Schools and Community Choral Workshops for the whole community, Short Black Opera for Kids offers an opportunity for practical reconciliation.